Washington: We're all braced for another grotesque video clip from the fundamentalist nutters of the so-called Islamic State, because they've released a primer on the likely beheading of two Japanese hostages – unless Tokyo will hand over a $US200 million ransom in the coming days. IS's video production values are sickeningly creepy – the prisoners in orange jumpsuits; their would-be executioner in black, wielding a knife and spewing bile. But in matters of jurisprudence, the Saudis are every bit as sickening as IS. They share the same Saudi-sponsored, ultra-conservative strain of Sunni Islam. And they think alike on crime and punishment – they both want to kill, kill, kill. Homosexuals? Kill them! Adulterers? If they're married, stone them to death; if they are unmarried, a lashing will do. A thief? Chop off a hand or a foot. But best of all, both the Saudis and IS get off on a good beheading. According to Human Rights Watch, there were 87 beheadings in Saudi Arabia last year – and they're off to a great start this year, with 11 beheadings already and still two Fridays left in January. Those silly Saudis think they can kid us into believing that they are not like that, but in recent weeks we have had a wondrous display of Riyadh's hypocrisy. They dispatched Minister of State for Foreign Affairs Nizar Madani to Paris for the leaders-linking-arms rally in the wake of the Charlie Hebdo massacre – which was as much for freedom of speech as it was against terrorism. 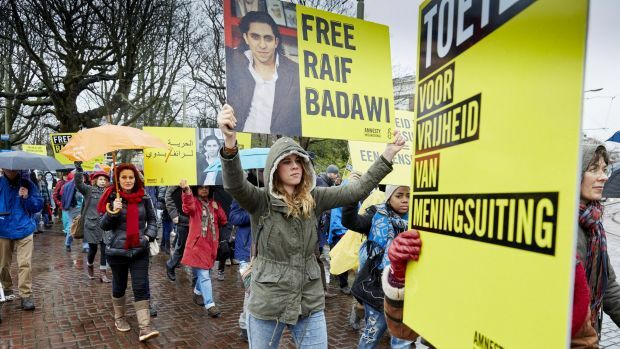 But back in Saudi Arabia, they were calling for crowds to assemble for the first in a series of 20 lashings for 31-year-old Raif Badawi, whose crime was to express himself freely. Badawi is, or was, a blogger before they shut him down in 2012, because of his criticism and questioning of the religious establishment – for which his punishment was fixed at 1000 lashes, 10 years in jail and a fine of more than $US260,000. In many ways Badawi is quite conservative. Urging a separation between church and state is not exactly radical; he rebuked the Muslims who lobbied for the right to open a mosque near New York's Ground Zero. And never mind the ballyhoo in the post-Charlie Hebdo world, with constant demands for Muslims to seriously debate the use and abuse of their religion. That's precisely what Badawi was doing – and look where it got him. 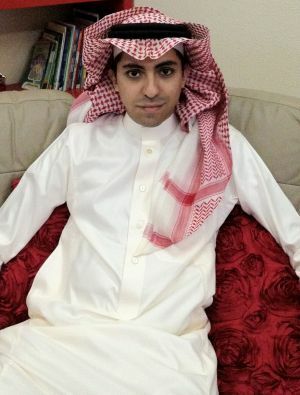 On January 9, the slight-framed Badawi was hauled from a bus in a square outside a mosque as Friday prayers ended in the port city of Jeddah – and dealt the first 50 of his 1000 lashes, by a uniformed man brandishing a wooden cane. The Saudis would have us believe that this punishment is administered caringly – the caner is required to move up and down the victim's back and to take care not to break the skin. But come last Friday, when Badawi was to get another 50 of the best, a doctor declared that his "wounds [from the previous week] had not yet healed properly and that he would not be able to withstand another round of lashes at this time". That was too much for Said Boumedouha, Amnesty International's deputy director for the Middle East and North Africa. 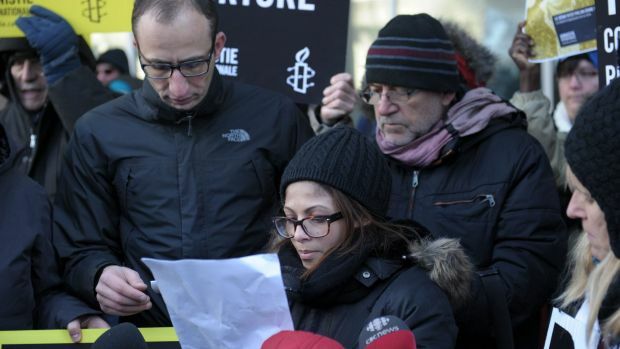 He retorted: "The notion that Raif Badawi must be allowed to heal so that he can suffer this cruel punishment again and again, is macabre and outrageous." When IS throws accused homosexuals to their death from the top of a tall building, it tweets pictures and uploads video to social media. But not those Saudi killjoys – when a policeman last week videoed the mediaeval beheading of a female migrant worker in the holy city of Mecca and exercised his freedom of expression by uploading the clip on YouTube, he was arrested and has apparently disappeared into the maw of the Saudi security system, reportedly to face unspecified charges in two courts – one military, the other religious. IS would have given him a medal. The Burmese woman, named as Laila bint Abdul Muttalib Basim in one report, was dragged through the streets and held down by four policemen, while it took three blows from the executioner's sword to sever her head – and as he hacked away, she used her last breath to scream: "I didn't kill. I didn't kill." How strange it is, then, that we're at war with IS, but the Saudis are our allies. We don't hear Barack Obama or John Kerry threatening to bomb the Saudis or even rebuking them. That's left to an eminently forgettable spokesperson at the State Department who utters a few words of criticism – you know the drill, always enough to say the US has been critical; but never enough for the Saudis to be seriously offended. And where is the crusading Tony Abbott when he's needed? There's a man who will go halfway around the world to bray at IS as a death cult, as he did in Baghdad recently. But just a stone's throw to the south of the Iraqi capital is Riyadh – Beheading Central – and Abbott has nothing to say about the royals whose robes never get bloodied despite all the killing, because they've contracted all that nasty stuff out to the Wahhabi clerics – of whom they live in fear.